Slice the zucchini into ribbons using a mandoline or vegetable peeler. Tear the kale away from the stems in little chunks. Lightly coat the grates of a grill with cooking spray. Bring the grill to medium-high heat and arrange the ribbons on the grates. Lightly sprinkle with salt and pepper. Once you start to see browning where the grates are, you can use some tongs and just remove them from the grill. The ribbons are so thin, there’s no real need to flip and grill the other side. To make the dressing, whisk together some olive oil, lemon juice, honey, and a pinch of salt and pepper. 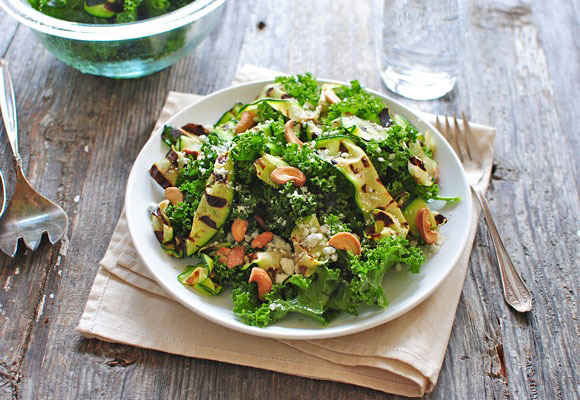 Toss the kale with the dressing in a bowl. Arrange on a plate and top with grilled zucchini ribbons, cashews, and a good sprinkling of blue cheese.